This past weekend we had a garden party at our "new" house in Yoakum. Pictured below are myself, my wife, Jenny, and our old friend, Dan, who almost got killed last year in a car accident. Dan does what he can, walks more than one would expect, and is getting back to gardening and using his chainsaw again. Since Yoakum is about a 2 hour drive from Austin, some folks stayed Friday night and some Saturday night. Dan made a huge and awesome peach cobbler with Fredericksburg peaches he pitted and froze last summer. I cooked fresh kale from my Austin garden, and black eyed peas saved from last year's garden. Folks brought dishes they prepared, fresh bread, fresh fruit, themselves, their ideas and their curiosity. We sat and talked on the grass, inspected the garden and fruit trees, took a long walk around our edge of Yoakum, which we share with cattle, goats, plenty of dogs and a few horses. We feel fortunate to have found this nice town, on the Guadalupe River, with good soil and very nice weather. I believe that we have an opportunity now to find places which will make the energy descent transition better. Yoakum has a few light freezes in the winter, good soil for growing vegetables year round, July lows at night average 71 degrees and August lows average 73 degrees. That's pretty tolerable for humans and for tomatoes. One suggestion at the gathering was that tomatoes are a pretty good marker for environments hospitable to humans. I hadn't thought of it exactly like that, but it's sure true. Yoakum is right sized for bike errands, too, I notice. Over the winter we have gotten a lot of tree pruning done, felled 3 large ans sick Chinese Tallow trees, planted 14 fruit trees, and have deeply prepared what has now become the vegetable garden. Sunday afternoon, Dan rode with me to Devine Avocados, where we spent over an hour with Bill Schneider, the wise old man of cold-tolerant Mexican avocados. We left with 8 potted avocado trees. I fancy an avocado orchard in Yoakum. The two Mexican avocado trees from Cousin Freddy, that we planted in December have fresh spring growth. There is a lot left unsaid there and so much left to do. If you didn't make it this weekend, maybe you can drop by another time. 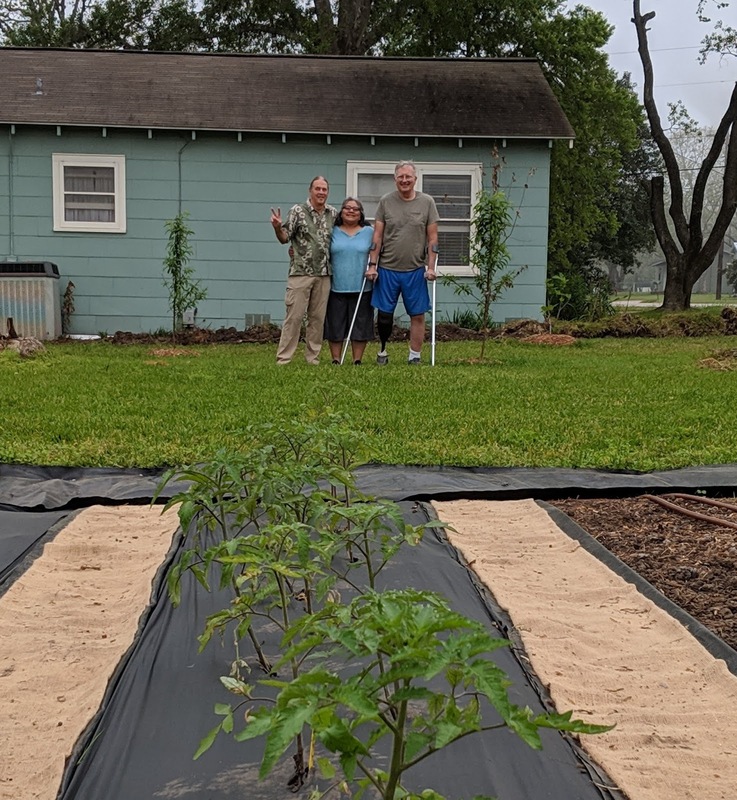 Maybe you might like to live in Yoakum some day, and grow some vegetables.